Hi Everyone!!! Hope everyone is having a great summer. We have been super busy this summer. I have been doing many crafts and fun projects with our son. He has been keeping me so busy. Now before I continue on too far I must get the formalities out of the way. I am so glad that you decided to join us on this hop!! 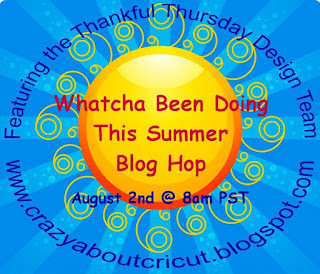 I want to thank our Design Team Leader and Hostess, Jenny from CrazyAboutCricut for having this fun hop. If you are just joining us please be sure to start at the beginning with our Hostess Jenny. I appreciate all of you that stop by to see what we're up to. Now for the fun to begin. Here is what fun we have been up to this summer. We have been involved in 3 different reading programs. Our son received a book from one of the reading programs. He loves the book and he's finding it's a funny read as he says. I love that he loves to read. We challenge each other with how many pages we will read. We made glowing sno cones too. He loved that one. He wants to do that one again. I will have to get pictures the next time we do it so I can post them here. They were really neat too. I will get started with the projects that I have to show you. These are fun little projects. Our son loves them because he has some incentives for the jar one. The book "The Mouse and The Motorcycle" is the book he received free from his reading program for completing a number of books. The jar says "Dream Big READ" this is the title for the reading program from our local library. The papers inside the jar have books on them that he's read it looks fuller than it is. I mentioned before he has incentives for reading. I want him to enjoy it; now he's enjoying it much more than he did at the beginning of the summer. He was given a choice of after reading 8 books that he could choose a chapter book or a learning Bible video ( *he loves Veggie Tales). He chose a Veggie Tale Video about listening. I loved his comments along with it ~"Mama, I would like this Veggie Tale Video because it talks about not listening and I haven't been doing a good job of listening. I want to make it right and learn." I love when he is so honest about what he needs to learn. Now for the notebook in the background that you see that says "Read Me!" this is something fun that we started. With my family it got a little tricky because it traveled down the street. We called that one out of play and made the rule that it had to stay here at our home. 1. 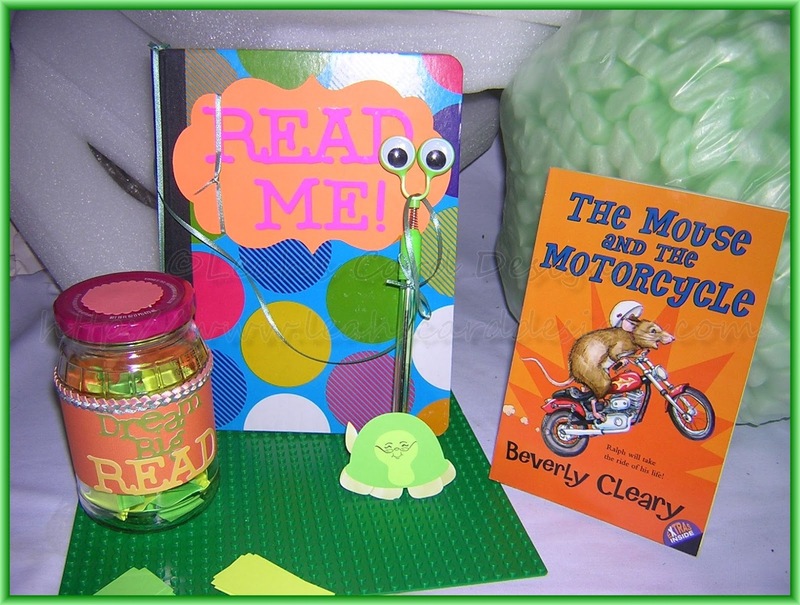 Print or craft the words "Read Me!" on the front of the notebook, attach your pen with the ribbon. Inside the cover write your invitation to read and write entries. Then also include a reminder to not be too clever when hiding your family notebook. I say this because you do want someone to find it. 2. Write the first entry then hide the notebook. Places like a laundry basket, under the kitchen sink, in the hutch, in a dresser drawer, in the mailbox (hehe, do this after the mail carrier comes); we have a sweet mail carrier ~ she decided to play the game with us. She left the notebook in the mailbox. When we got it we were surprised with her entry. Thank you Julie :)! When someone comes across the notebook they first write some family news then hide the notebook again. 3. This is a fun thing to do because the longer the game is play the more memories you will have. We write first where we find the notebook then add in our reaction to where we found it. Everyone reacts different so do be afraid to hide it in the same spot as you found it sometime. Just don't do it right then because the one that hid it there may check to see if it is moved. You want to keep the fun going. After we write our reaction then we write the family news we have then the notebook is off to its new hiding spot. Now to send you off for more fun. I am now going to send you on your way to see our very talented Cheryl at Cards By CG. Thanks for stopping by to see me. love your project Leah, such a fun idea!! Leah! This is such a great idea! I'm going to adapt it for my homeschooling! great job!! I'll have to scraplift your notebook idea... that's just too cute! That is such a good idea, the notebook. I love it! So cute too. Thanks for the hop! What a cute idea! And such a sweet little guy you have too. ;) Love it!! Wow, what a super fun way to create a game, full of suspense. 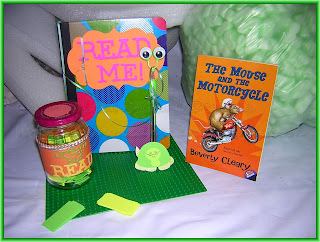 What a great way to have a family fun time game - and help kids learn - I remember "The Mouse and the Motorcycle", also.... Great Read... Wonderful ideas!!! I just may need to do something like this with my students in the fall. TFS. ROFLMAO Leah! Great minds think alike, huh? that's awesome!